Sony color print material comes in packages with everything included so that you don't have to buy separate ribbons and paper. Each model includes paper and a ribbon of color print material for the exact amount of prints described in the package. Please see the listings below for exact print quantities in each package. The UPC-55 Color Print Media is designed for use with the UP-55MD, UP-D55 and UP-D55MD Digital Color Printers. Each pack of media is packaged with 2 individual packs of 100 sheets each and 2 ribbons. Pricing is per pack of 200 prints. 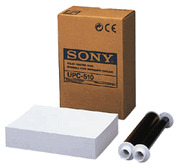 Sony UPC-510 is used in the Sony UP-51MD and UP-51MDU color printers. Each pack includes 200 sheets of paper and ribbon for 200 prints. UPC-510RM/T is a ribbon only model if you have extra paper. The Sony UPC-21L is the larger size (5"x3.6") print media for the UP-20 and UP-21MD color printers. Each package has 200 paper sheets and ribbon capacity.